Today’s polish is from the collection Depend made to celebrate their 25th anniversary. The formula is a bit sheer so I think it’ll take three coats to make it opaque on its own. I decided to layer it over a lovely blue from Sally Hansen: “Beatnik”. 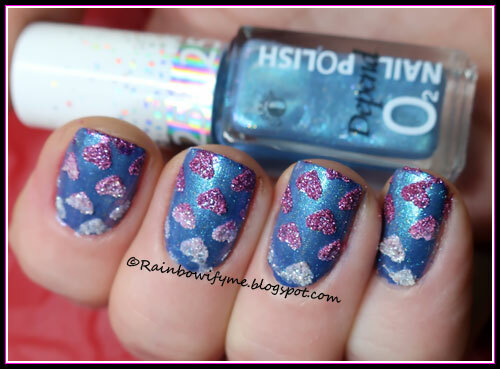 I used it as a base for nail vinyl art: Gradient hearts. 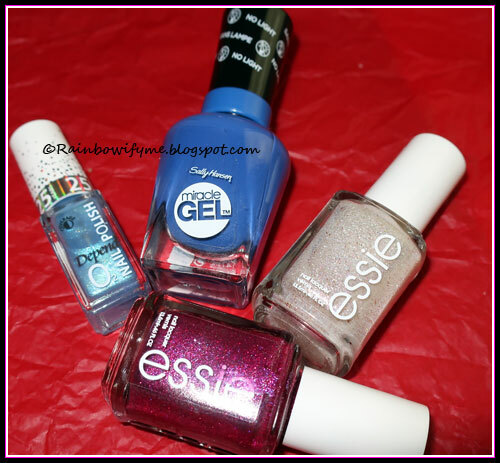 I used two Essie polishes for the gradient: “Venture to the Venue” and “City Slicker”. I didn’t topcoat it because I liked the grittiness over the shimmer, take a look. This is one coat of Depend’s #576 over Sally Hansen’s “Beatnik” plus a layer of topcoat. 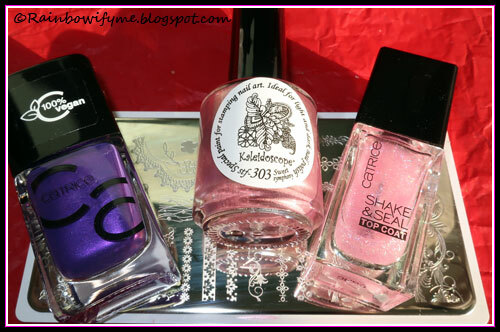 Here are the polishes I used today. I couldn’t catch the pink shimmer on the camera, so you just got to take my word for it. 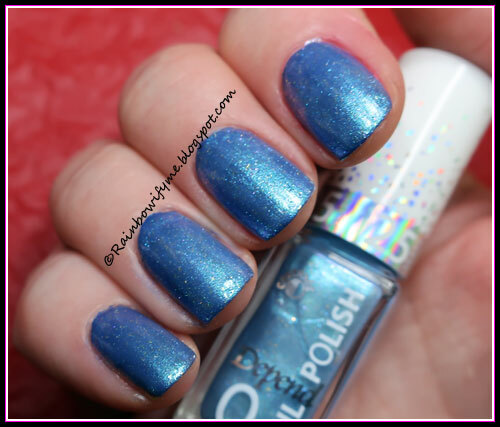 It’s a beautiful blue shimmer, I really like it. 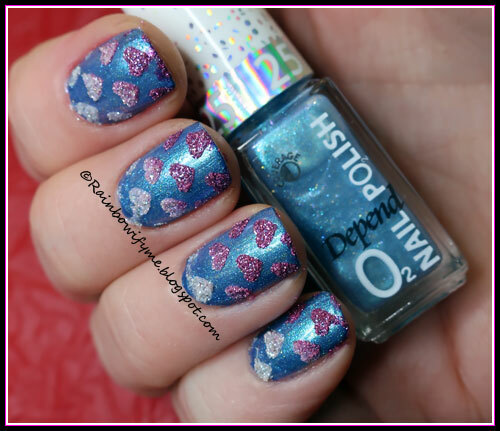 “Some Berry To Love” is from the The Berry Patch Summer 2015 Collection. It’s a gorgeous pink strong linear holographic. The formula is really good and the polish covers so well that you can get away with one single coat. I used two coats though and the drying time is really good. 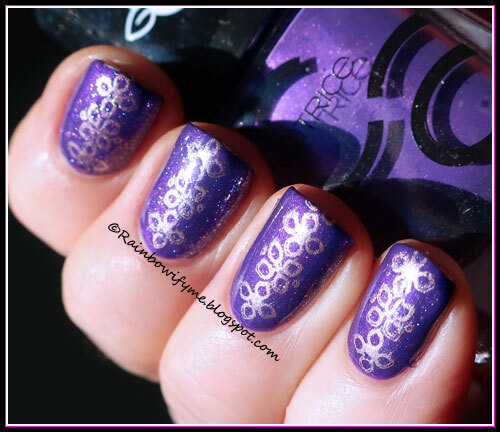 The stamp is from Moyra’s stamping plate “53-Textures” and I stamped with a dark purple shimmery stamping polish from El Corazón called “Restless Night”. Here’s the final manicure including a layer of topcoat. The picture is taken with flash to show off the lovely rainbows. Here’s the same thing photographed under a lamp. This is “Some Berry To Love” alone, two coats and no topcoat yet. The photo is taken with flash. Here are the things I used today. I love pinks like “Some Berry To Love”, I think it’s a really lovely colour! 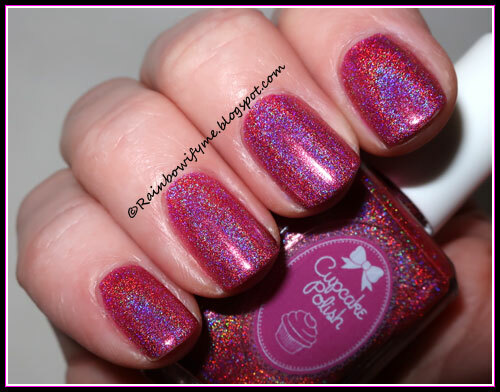 Today’s polish is a lovely purple with a gorgeous shimmer. The formula is really good and the polish covers well. I used two easy coats for full opacity and the drying time is good. I applied extra shimmer over it before I stamped on it. 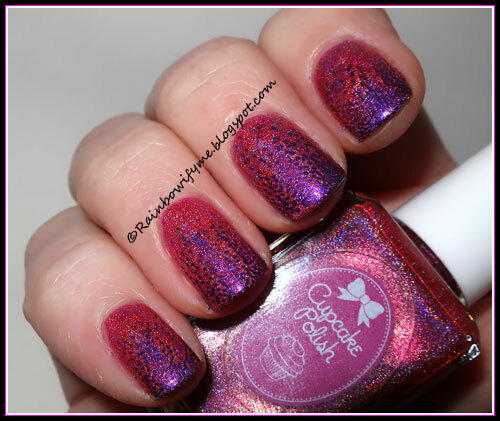 The shimmer is also from Catrice and is called “Offshore Beauty” and if from the line of “Shake and Seal topcoat”-polishes. 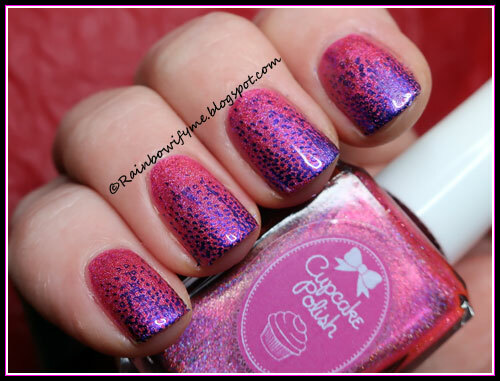 The stamp is from the stamping plate “ZJOY-048” and I stamped with El Corazón’s stamping polish “Sweet Symphony”. 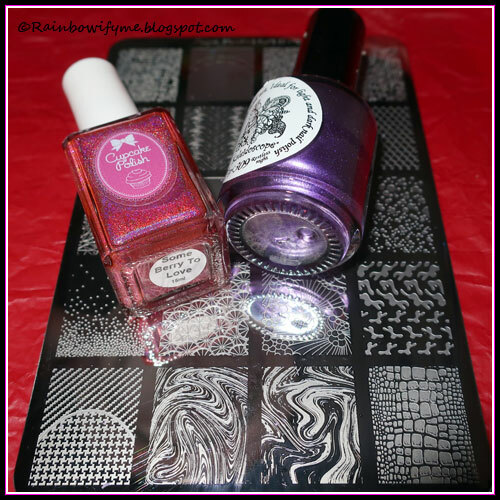 And here’s “If Not Purple… Then What?” alone; two coats and no topcoat. This is the stuff I used today.